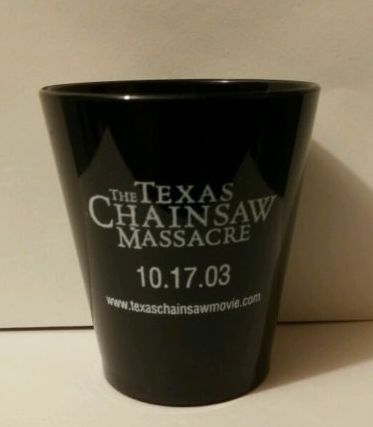 Ebay Find Of The Week: ‘Texas Chainsaw Massacre’ Shot Glass! Shots! Shots! Shots! Shots! Fitting considering it’s Cinco de Mayo and I’m craving tequila. But anyway, why take a shot out of a boring shot glass that you picked up on your road trip to Nebraska when you can put your lips onto this promotional shot glass from the remake/reboot of The Texas Chainsaw Massacre?!? Unfortunately, they weren’t able to coordinate Jessica Biel’s wondrous white tank top into the design of the shot glass, but it’s a shot glass nonetheless. Some good news is that the seller on eBay has about 10 of these and is accepting offers and is including ‘free shipping’ as well. So, I’m guessing you could probably snag one for around $5 in total. If you’re feeling like you need this in your life, then go to the listing HERE and do your business. Or you can just go to Youtube and look up slow-mo shots of Jessica Biel running around in that white tank top. Your choice. This entry was posted in Feature and tagged dirty horror, ebay find of the week, ebay horror, ebay horror items, eBay horror listings, eBay horror movie listings, eBay promotional horror, feature, horror shot glasses, jessica biel, jessica biel texas chainsaw, jessica biel texas chainsaw tank top, texas chainsaw massacre, texas chainsaw massacre remake, texas chainsaw promotional items by Dirty Horror. Bookmark the permalink.